(CNS): Sharks in the Bahamas are to be offered legal protection according to the local media. The Tribune is reporting that new legislation is currently under review by the country’s Attorney General after a 10 months campaign by the Bahamas National Trust and the PEW Environment Group to make the Bahamas a sanctuary for sharks. The islands are home to one of the world's healthiest shark populations, while global populations but at present there are no laws to prevent shark fishing or the export of shark meat and fins. Meanwhile, the lack of protection for sharks in Cayman was raised recently when a hammerhead was sold for meat at the George Town fish market. 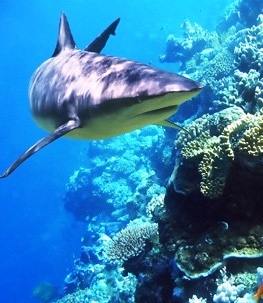 Although the sharks are protected when they are within the waters of the Cayman Islands' marine parks there is no protection for them anywhere else. Globally all shark populations have declined dramatically, including the scalloped hammerhead, which the International Union for Conservation of Nature (IUCN) lists as endangered. This means this type of shark is considered to be facing a very high risk of extinction in the wild. Locally these sharks were sighted with more regularity no more than a decade ago. However, in recent years sightings have diminished for unknown reasons and the current status of local populations of scalloped hammerheads remains largely undetermined. Last month during Penny Palfrey’s record breaking swim between Little Cayman and Grand Cayman three whitetip sharks were killed as they posed a threat to the marathon swimmer. The DoE said that the whitetip has decline by 99% in the last fifty years. However the department is involved in atwo year collaborative study with Marine Conservation International (MCI), the Guy Harvey Research Institute (GHRI) at Nova Southeastern University and the Save Our Seas to better understand the current status of sharks in our local waters. The project is funded by the UK’s Overseas Territory Environment Programme (OTEP) and the Save Our Seas Foundation and will result in comprehensive management recommendations to ensure sharks receive the protection and recognition they so desperately require. When did this become an article about Penny Palfrey…… ? This is not directly about her… but since it seems she's the subject….. i want to know what would have happened if the 3 sharks in question were not killed off… what would have became of her…. ? Is she not one of God's creations too….. So…… if the fishermen had not 'done something' about them and they attacked her ate her wouldn't that be another controversy; 'WHY DIDN'T SOMEONE CATCH THE SHARKS…. NOW SHE'S MAMED OR DEAD' you would hear the people dem say…. then she couldn't make her little record…. Aye…. this nation just can't get it right….. THE LAW OF THE OCEAN IS…… 'KILL OR BE KILLED' when it comes to the predators of the sea…. remember; we are entering THEIR territory…so ya better be ready to face the consequences… SIMPLE AS THAT…. Can we get over this shark thing now please! If a so called 'Christian' group or nature enthusiasts group were on a diving excursion….. WHAT WOULD THEY DO ABOUT THE SHARKS??!! Would they be prepared to 'meet their maker' or try to save their own lives somehow even if it meant 'killing' one of God's creations……. TELL ME! SOMEBODY PLEASE…. If they were truly christians, why would they not be prepared to meet their maker? If they were true christians, why would they not trust their god? Anyway, the point alot of people are making and the point you may want to consider is, Why do something for your pleasure that ends up with the silly slaughter of 3 endangered creatures???? That's the point! Even real, true Christians fear DEATH no matter what…. that's a fact…..
So….. I agree with your last sentence….. thanks for your response and input…..
your right, we are in their teritory…..so why should we kill them when they are just doing what everyone else would do in that situation. if her life was in danger you are telling me that the only thing they could have done was to KILL the sharks?? SERIOUSLY?! yes she is one of God's creation but why is that when we enter THEIR teritory to better ourselves that nothing else matters and we can do what we like with other God's creations that were there first! it is their home! if her life was in danger she should have forgotten about the little world record…dont you think her life is more important than a record? she should have know about the dangers but yet she went along with it and did anything to complete it, no matter what stood in her way. i mean congrats to her for accomplishing this record but she is no hero in my books IF they did kill three sharks that were just doing what they naturally do everyday! EXACTLY!! Thanks for your input…… you filled in something that i was missing……… FINALLY! someone who sees this situation through my view…. very true about the part that she should have halted the swim…. and….. she should have said 'no it's not fair to kill them just for me…and I am threatened and I'll forget about my record if it is going to result in slaying animals in vain'… shouldn't that have been the right, civil, SANE thing for her to do…. why aren't they giving HER HELL for that and leave the fishermen alone…… ahhh…the IRONY….. funny how society works huh…. there should be a totally different issue/article about THAT SITUATION as to why she didn't speak out against the sharks' death…. how does that make her look as a 'humane' member of society…. SHE IS THE SOLE REASON the sharks died….. 3 lives to spare 1 life….. HUH……. NOT FAIR AT ALL & doesn't balance out……. In days of old the waters off Cayman were full of turtle, grouper, conch, and all other kinds of fish. Now there are just a few left around here and the laws do too little to protect them from the same kind of persons who have taken all the rest. To even insinuate that Caymanians themselves are not the guilty ones and people like Penny doing what she did holds any responsibility for any of the massive kill off is just plain dumb. But this is Cayman. Where anyone who knows nothing about anything can say out loud I know more than anyone about anything and most people will agree. Your only fooling yourselves. This is way too little and way too late. The Bahamas record on protecting sharks is abysmal. The result has been disastrous. Sharks get used to responding to the sound of engines and can't tell the difference between a dive boat and a fishing boat. When I was out there 22 sharks were killed just off Walkers Cay in just one morning. They were hooked, hauled onto a fishing boat, then their fins were hacked off before the rest was dumped back in the sea and it wasn't an isolated incident. Penny couldn't comment. Her tongue was swollen, remember? Does no one read the articles except for all the sensational crap? I wouldn't comment either. If she said taht it didn't happen, then people would say, "cover up". Why bother saying anything? She was vilified anyway no matter what she said. isn't it sad that she is unable to comment on her world record swim because of the actions of others? Well she could comment now….! It IS covered up…. just not very well. Lots of people saw the killing and some closely involved are just too proud of their work. Penny Palfrey was poorly equiped for the certainty of an oceanic whitetip encounter in the open Caribbean sea at night. It was careless for her to rely solely upon experimental shark repellent when dealing with an aggressive opportunistic predator whose behavior is highly unpredictable. If she was getting bumped and brushed by whitetips during the night, then she was surely only moments away from disaster and should have abandoned her attempt. Cages should be required for any future oceanic record attempts. No sharks or other endangered wildlife deserve to be killed in the name of vain stunts. Actualy, if she was getting brushed and bumped by whitetips during the night (or even just had one swiming under her) then she clearly wasn't moments frm disaster since she swam with them for many hours (throught he night) and no disaster occurred. If these things were really as oppertunistcally aggressive as you make them sound we (who go sea swimming) would all be dead by now. But, like Ms Parfrey, we're not. The point is, the sharks didn't need to die for her stunt. Thank You. Seems a whole lot of people are missing this simple, basic point. Agreed….. shame huh…. all for someone trying to make a BIGGER name for themself…. somehow I wish they had left them alone to see if they would swim under her or just bump her…… too bad we can't turn back the hands of time to see what would have really happened…. then the world would have learned more about shark behaviour and anyone else would think twice aboutattempting this type of long distnace swimming…. Feel free to swim with the whitetips if you want to, but it's not a great idea. Another Caymanian professional open water swimmer with obviously (to anyone else) no experiance tells everyone how they should do it. pity penny did not make any comment after her swim….i sense her embaressment…don't think she will be recommending cayman to many people…..
she got the the 'cayman kind' experience…. not sure what that means, but she certainly holds responsibility in this thing. the whole affair was certainly a embarassment for Cayman, lets hope the CITA and Flowers Water etc demonstrate better judgement in the future and avoid sponsoring /allowing events such as these which cast us in such a negative light. I can understand why Penny said nothing, I would be ashamed too if I were her. Tourists want to see turtles on the beach and parrots in the trees not turtle soup and shark baiting. Come on CITA wake up! For many reasons but none obvious to many here.